What is the difference between series and parallel? Series operation is simply signal flowing in and out of one device, and then flowing in and out of a second device, in sequence. For example, running a cord from your guitar, into an effect pedal, then to another effect pedal, then to the amp is series operation. Parallel operation is signal flowing in and out of both devices at the same time. 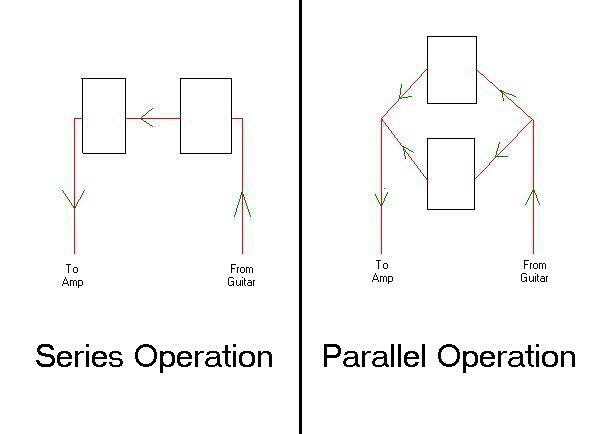 For example, if you ran a cord from your guitar, and split it so that it went to the inputs of two effects pedals at the same time, and then ran the outputs of both effects pedals to a splitter (bringing the signals back together), then to the amp, is parallel operation. Parallel operation is especially useful when using time-based effects, such as delays and modulation. The pedals can't "hear" each other when used in parallel. Ever hook up two delays and try to use them together? Ever notice that it gets muddy real quickly? This is because the second delay "hears" the first delay, and not only does it echo the guitar signal, but it also echos what it's "hearing" from the first delay. Well, when you run the delays in parallel, they don't hear each other. So, you can literally run a slap-back type delay on one delay pedal, and run a longer, trailing, ambient delay in the other delay pedal, and they BOTH stay the same!